Power Rangers Turbo is the fourth incarnation, and fifth season overall, of the Power Rangers franchise; utilizing the costumes and props from Gekisou Sentai Carranger, the 20th season of the Super Senti series by Toei Company, Ltd. It was a direct continuation of Zeo and Mighty Morphin featuring Tommy Oliver (Jason David Frank), Rocky DeSantos (Steve Cardenas), Tanya Sloan (Nakia Burrise), Adam Park (Johnny Young Bosch) and Katherine Hillard (Catherine Sutherland) as the Power Rangers. 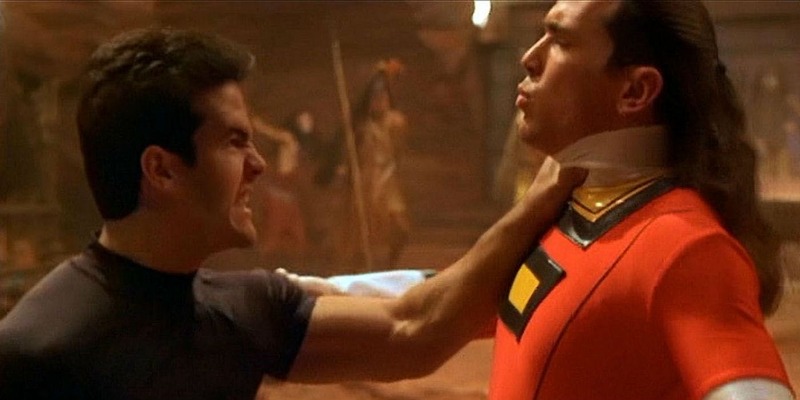 Unlike the other seasons, Turbo began with the franchise’s second theatrical feature film: Turbo: A Power Rangers Movie. Written by Shuki Levy and Shell Danielson, and directed by Levy and David Winning, the film contained completely original footage like Mighty Morphin Power Rangers: The Movie. However, this time around, they used the costumes (or similar ones, anyway) and props from Carranger and kept the action scenes similar to the Super Senti style. The film was also canonical, bridging the gap between the two incarnations. The film introduced Divatox (written with Grace Jones in mind, but played by Hilary Shepard Turner), an intergalactic space pirate searching for a golden key to access a dimensional gateway on Earth called the Nemesis Triangle. Her goal: to marry a demon named Maligore (Mike Deak) in exchange for riches and power. A wizard named Lerigot (Jon Simanton & Lex Lang) came to Earth to warn Zordon (Winston Richard & Robert L. Manahan) and Alpha 5 (Richard Steven Horvitz), but ended up lost in Africa. Divatox’s dimwitted nephew, Elgar (Kenny Graceson & Derek Stepen Prince), was tasked with finding human sacrifices to revive Maligore. After rejecting Bulk (Paul Schrier) and Skull (Jason Narvy), he settled on former Rangers Jason Scott (Austin St. John) and Kimberly Hart (Amy Jo Johnson, making her return to the franchise). Zordon and Alpha gave the Rangers new Turbo powers to face Divatox and her minions and save their friends. The Rubo Rangers and their personal weapons. The Turbo film was shot at the same time as the production of Zeo. Billy Cranston (David Yost) was meant to play a large part in the film, helping to develop the new Turbo powers (which would explain his frequent absences and mysterious special project during Zeo), but after Yost’s departure over harassment about his homosexuality it was rewritten that Zordon and Alpha 5 created the powers. It was intended for the Zeo Rangers to appear and lose their powers in a fight with Divatox, necessitating the use of the Turbo powers. Ultimately, only Katherine used her Zeo powers during the film. Rocky was injured during a martial arts competition as a way to write-out the character from the film and series so that Cardenas could focus on running his dojo; however, Cardenas would stay on staff as a stuntman (which he did during the film). He was replaced by 12-year-old Justin Stewart (originally Justin Dinkelhuber, played by Blake Foster), a child prodigy who attended Angel Grove High School and accidentally stumbled on the Rangers’ identities when he was visiting the hospitalized Rocky, his idol. Justin’s mother had died when he was younger, and his father was always away on business trips. Although the Senti series used the concept of a child Ranger twice, this was a first for the American series. The new Turbo Power Chamber. Other changes included another facelift for the Power Chamber, which looked significantly different than its Zeo counterpart. 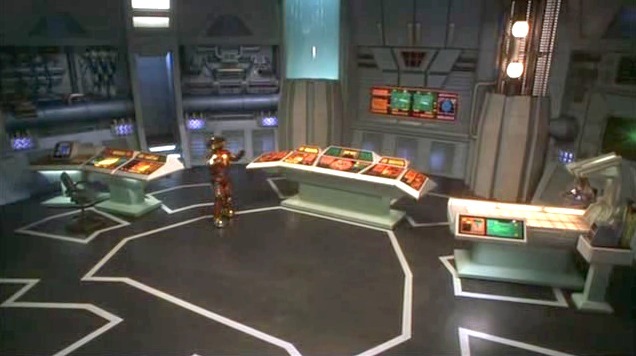 The exterior of the Command Center was stock footage from the first film, but returned to the show’s version during the series. Alpha 5 also gained a new design, which was shared by his replacement. Bulk and Skull were reunited with Lt. Stone (Gregg Bullock), despite heading off to Paris in the last series. They worked with Stone as security guards before Stone eventually took over the Angel Grove Youth Center following the off-camera retirement of Ernie (Richard Genelle). During the series, Bulk and Skull would be transformed into monkeys voiced by the actors while work commenced on a proposed spin-off series that never materialized. Schrier and Narvy would also work as co-directors on the series, as appeasement for their feeling underutilized in the film. Turbo: A Power Rangers Movie was produced by Saban Entertainment and Toei, and distributed by 20th Century Fox to theaters on March 28, 1997. It received overwhelmingly negative reviews and earned only over $9 million at the box office. The poor performance of the film cancelled plans for any future film outings down the road. Originally, Levy wanted it to feature the return of the five original Rangers; however only Johnson, because of her contractual obligations, and St. John, after his terms for more pay and making Jason evil (albeit temporarily) were met, agreed to appear. The original cut for the movie was over 3 hours long, with numerous action sequences and a mermaid character named Mandika cut out to shorten it. Also removed was a romance between Jason and Kimberly, although it was alluded to through the character’s actions (and would explain why the boyfriend Kimberly dumped Tommy for off-screen and Jason’s Zeo girlfriend were absent). The Turbo Morphers appeared on the Rangers’ wrists in times of need. To activate their powers, the Rangers would insert Turbo Keys and exclaim “Shift into Turbo!”, replacing “It’s Morphin Time!” for the first time. 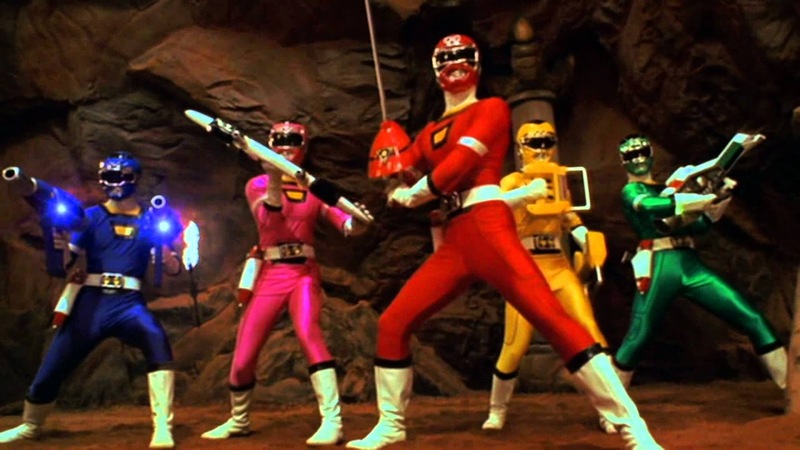 Along with the Auto Blasters and Turbo Blades, each Ranger had their own personal weapon: Red the Turbo Lightning Sword; Blue the Turbo Hand Blasters; Green the Turbo Thunder Cannon; Yellow the Turbo Star Chargers, which used powerful amounts of electricity; and Pink the Turbo Wind Fire, a bow that fired bolts of energy. These weapons were assembled into the miniature race car, the Turbo R.A.M., which brought them into the battle when summoned. The weapons could also be combined with the R.A.M. to form a powerful cannon. The new Turbo Zords, which were all types of cars, were designed by noted car designer George Barris. Divatox with Porto and Rygog. Power Rangers Turbo would begin on FOX as part of the FOX Kids programming block nearly a month later, debuting on April 19, 1997. 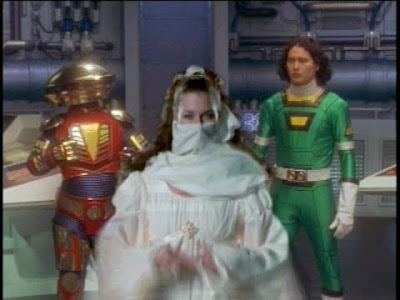 During production, producer Jonathan Tzachor wanted to embrace Carranger’s slapstick comedy while story editor Douglas Sloan wanted to keep up the more serious tone Zeo set. When Sloan left and was replaced by Judd Lynn, Lynn agreed with Tzachor’s take and pushed for more comedy in the show. The writing staff was split on this decision, but ultimately the serious tone remained largely intact outside of some unavoidably silly moments. The writers included Sloan, Levy, Lynn, Danielson, Mark Hoffmeier, Barbara A. Oliver, Tony Oliver, Jackie Marchand, Ralph Soll, Mark Litton, Steven J. Weller, Peter Elwell, Brett D. Born and John Fletcher. Ron Wasserman, Kenneth Burgomaster, Jim Cushinery, Jeremy Sweet, Paul Gordon, Inon Zur and Glenn Scott Lacey served as the series’ composers. The unholy alliance of Divatox and Rita Repulsa. Originally, the plan was to have Rita Repulsa (Carla Perez & Barbara Goodson) and Lord Zedd (Ed Neil & Robert Axelrod) as the main villains again for the series, with Divatox eventually joining them. However, their appearances were limited to segments on FOX Kids dubbed “Weird Week” where they would introduce and heckle each show with Divatox; marking her first appearance before the film’s release. When the show began, Divatox would be played by Carol Hoyt for the first 25 episodes while Turner was on maternity leave. The two actors had different approaches to the character: Hoyt played Divatox as cruel and calculating, while Turner was more comedic. Along with Elgar and the franchise’s usual assortment of monsters, Divatox was served by her second-in-command Rygog (Neil & Lex Lang); Porto (Scott Page-Pagter), her technical advisor; and her foot soldier Piranhatrons and Putra Pods. Occasionally, Divatox was helped by her brother, General Havoc (Richard Cansino & Tom Wyner), and his robotic foot soldier Chromites. Sometimes their mother, Mama D. (Carol White) got in on the action as well. Dimitria and Alpha 6 confer with the Rangers. Within the first few episodes of Turbo, Zordon and Alpha 5 were written out of the show as having journeyed to Zordon’s home planet of Eltar (the only part of the first movie made canon) after a wormhole was discovered leading there and Lerigot freed him from his time warp prison. In their places came Dimitria (Hoyt), a wise woman from the planet Inquiris, and Alpha 6 (Catherine Battistone, using a New York-type accent). Unlike Zordon, Dimitria initially didn’t share her wisdom freely and often spoke in questions to force the Rangers to come up with the answers themselves (until that was dropped halfway through the series as it proved an annoyance to both cast and fans). Over the course of the series, it was heavily implied that Divatox was Dimitria’s twin sister (explaining why they shared an actor) who was kidnapped when they were younger. Both Frank and Sutherland expressed a desire to leave during Zeo; having grown tired of the daily grind required to produce a season and wanting to explore other projects. Producers convinced them to remain for the first 19 episodes of Turbo as they searched for replacements. Instead, they decided to replace everyone except Foster as the Screen Actors Guild kept pressing the actors to join, which meant Saban would have to pay them more. Bosch and Burrise learned about their being let go when they saw the casting call in the newspaper. Their replacements were T.J. Johnson (Selwyn Ward) as the Red Turbo Ranger, handpicked by Tommy after his bravery in rescuing him from an attack; Cassie Chan (Patricia Ja Lee) as the Pink Turbo Ranger, a singer who moved to Angel Grove, befriended T.J., and helped him rescue Tommy and Kat; Carlos Vallerte (Roger Velasco) as the Green Turbo Ranger, a recurring character who played on the soccer team coached by Adam; and Ashley Hammond (Tracy Lynn Cruz, who played a minor role in an episode of Mighty Morphin) as the Yellow Turbo Ranger, a cheerleader from Angel Grove High that helped civilians get to safety during a Divatox attack. The veteran Rangers were written off as leaving for college. The team also gained new vehicles in the form of two sentient cars of alien origin that Divatox tried to possess: Lightning Cruiser, which was fast and could go airborne, and Storm Blaster, which could traverse rough terrain and was mounted with the Turbine Laser. New allies were also introduced. The Phantom Ranger (Ali Afshar, as Alex Dodd), a mysterious Ranger from the planet Eltar, would appear in their times of need. He also provided them with new Rescuezords after the Turbo Megazord was taken by Divatox, and stored them in his Zord, the Artillatron. There was also the Blue Senturion (David Walsh), a robotic policeman from the future who came to warn about an attack from the United Alliance of Evil (previously mentioned in Zeo), an organization that assembled the worst villains in the universe together. Unfortunately, that warning came too late as the leader of the Alliance, Dark Specter (Terence J. Rotolo & Christopher Cho), had invaded Eltar and captured Zordon. 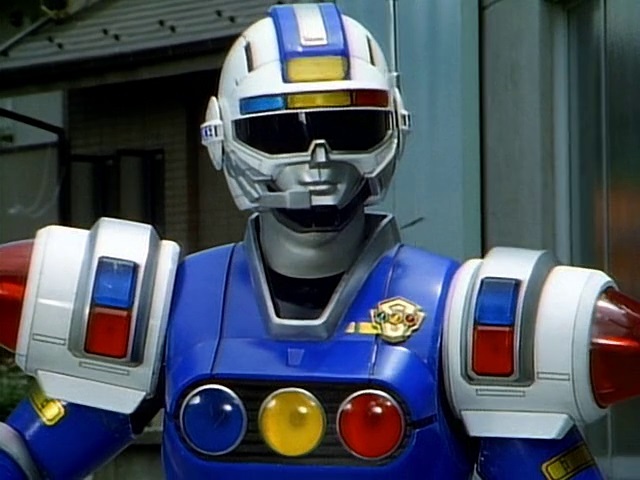 Blue Senturion was the first non-Ranger character to have his own Zord, the Robo Racer. Goldgoyle takes on the Megazord. The season ended with the Turbo and Rescue Megazords being destroyed by Divatox’s most powerful monster, Goldgoyle (Wyner), and Divatox destroying the Command Center, effectively leaving the Rangers powerless. Divatox was recalled by Dark Specter after capturing Zordon and she left Earth, as did Dimitria and Blue Senturion to aid in Zordon’s rescue. The Rangers commandeered a space shuttle from NASADA, a space program aware of the presence of aliens, to pursue Divatox. Justin opted to remain behind with his father. All of these events provided a direct set-up for the next season of the show. As with other entries in the Power Rangers franchise, Bandai produced a line of action figures and other merchandise based on the show. In 1997, Acclaim Comics published three graphic novels: Into the Fire and Other Stories and Simple Simon Says and Other Stories , which featured additional stories based on Masked Rider, Beetleborgs and Samurai Pizza Cats, and Power Rangers Turbo vs. Beetleborgs Metallix serving as a crossover between the two franchises. They returned to comics during BOOM! Studios’ crossover event “Shattered Grid” in 2018, which ran through their two ongoing Rangers titles and special issues. Blue Senturion also got his own starring feature in a backup story in those issues teaming him up with Ninjor to track down criminals posing as Rangers. 20th Century Fox released the film on VHS in 1997. In 2001, they released it on a double-sided DVD with the first movie, and then on its own in 2012. Also in 2012, Time Life Entertainment released Power Rangers: From Mighty Moprhin to Lost Galaxy containing the complete span of those shows over 40 DVDs. In 2013, Shout! 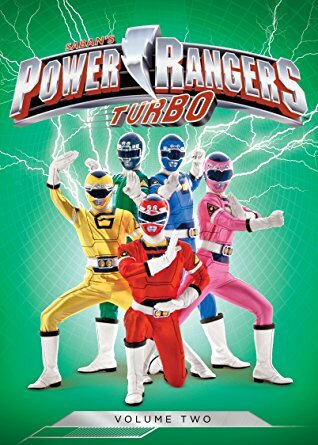 Factory released Turbo as part of the Power Rangers: Seasons Four-Seven box set, and later independently across two volumes. They also released Power Rangers Legacy, which contained seasons 1-20 in a collectible Red Ranger helmet package. As they didn’t have the rights to the two movies, slots were left open for their inclusion. In 2017, Fox re-released the double collection and the single edition the following year. “Shift Into Turbo, Part I” (4/19/97) – As the Rangers prepare for their upcoming graduation, Divatox returns to get her revenge on them. “Shift Into Turbo, Part II” (4/26/97) – With the senior Rangers busy, Justin goes to face Elgar alone after Bulk and Skull are changed into monkeys by him. “Shift Into Turbo, Part III” (4/30/97) – Zordon announces he and Alpha 5 are returning to Eltar, leaving Dimitria and Alpha 6 in their places. “Shadow Rangers” (5/1/97) – Divatox sends Chromite to Angel Grove where he steals the Rangers’ powers and creates Shadow Rangers. “Transmission Impossible” (5/2/97) – Divatox intercepts a messenger from Inquiris and turns him against the Rangers. “Rally Ranger” (5/5/97) – Elgar sabotages Justin’s box car race while Porto decides to attack the city on his own. “Built for Speed” (5/6/97) – Demon Racer plants a detonator in one of the cars Adam’s friends are going to use in a drag race to settle an argument. “Bicycle Built for the Blues” (5/7/97) – Divatox sends Justin a bike for his birthday, which will explode in 25 miles. “The Whole Lie” (5/8/97) – The Mouthpiece monsters makes it so Justin can only tell lies, and Porto arranges it so that whenever a Ranger lies a Pirahanatron attacks. “Glyph Hanger” (5/10/97) – Divatox calls in her ex to help her defeat the Rangers, and he plants a pyramid-shaped detonator in an Egyptian exhibit. “Weight and See” (5/12/97) – Kat’s weight worries after a negative comment prove moot when Numbor makes her weightless. “Alarmed and Dangerous” (5/13/97) – As Justin deals with bullies, Divatox has fires set all over the city and has a detonator planted on a firetruck. “The Millennium Message” (5/17/97) – Blue Senturion arrives from the future to warn Dimitria about the United Alliance of Evil. “A Drive to Win” (5/19/97) – Divatox plants a detonator on the scoreboard of Adam’s soccer game, set to go off when the score reaches 4 points. “Cars Attacks” (5/20/97) – Divatox plants a detonator at the competition Kat participates in to get into London’s Royal Dance Academy. “Honey, I Shrunk the Rangers, Part I” (5/21/97) – Shrinkasect is sent to mess with Blue Senturion’s hardware and shrinks the Rangers in the process. “Honey, I Shrunk the Rangers, Part II” (9/9/97) – Justin has to unsrunk Blue Senturion and find the detonator Bulk and Skull took while the Rangers try to escape Divatox’s sub. “Passing the Torch, Part I” (9/10/97) – Mamma D has Divatox attempt to capture Tommy and Kat, but TJ and Cassie come to their rescue. “Passing the Torch, Part II” (9/11/97) – Tommy rejoins the Rangers to defeat the Flamite monster, and the senior Rangers all name the successors to their mantles. “Stitch Witchery” (9/12/97) – Divatox casts a spell on a jacket Ashley designed, turning anyone who wears it rude and grouchy. “The Wheel of Fate” (9/15/97) – Divatox goes after Lighting Cruiser and Storm Blaster, and abducts Justin in the process. “Trouble by the Slice” (9/16/97) – When Divatox loses her memory, she ends up with a job in a pizza parlor. “The Phantom Phenomenon” (9/17/97) – Divatox sends Elgar to rob the bank and gold mines to increase her fortune, but the Phantom Ranger looks to put a stop to her plans. “Vanishing Act” (9/18/97) – Divatox sends Translucitor to turn everything in Angel Grove invisible—including the Power Chamber. 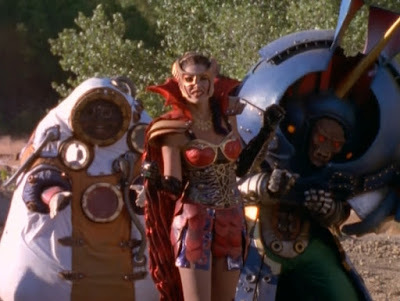 “When Time Freezes Over” (9/19/97) – When the Rangers stop Divatox from freezing the sun, she uses Clockster to rewind time so she can stop them first. “The Darkest Day” (9/22/97) – General Havoc arrives to help Divatox and uses his own zord to capture the Turbo Megazord. “One Last Hope” (9/23/97) – The Rangers try to protect the city without the Turbo Megazord, and luckily the Phantom Ranger comes through with some help. “The Fall of the Phantom” (9/25/97) – Divatox kidnaps Cassie to exchange her for the Phantom Ranger, and manages to steal the ruby that gives him his power. “Clash of the Megazords” (9/26/97) – Divatox uses the Turbo Megazord to attack the Rangers while they try to take down her space station. “The Robot Ranger” (10/3/97) – Justin begins to suspect that his friends have been replaced by robots. “Beware the Third Wish” (10/17/97) – Wicked Wisher is sent to Earth and enchants three coins from a well to grant Divatox three wishes, but one ends up lost on Earth. “The Gardener of Evil” (10/20/97) – Wild Weeder and the Rangers search for the coin, which has ended up in Bulk and Skull’s possession. “Fire in Your Tank” (10/30/97) – When Elgar steals the Rangers’ booster fuel, Divatox creates her own flying car. “The Turn of the Wretched Wrench” (10/31/97) – Divatox sends a monster to increase Ashley’s difficulties in shop class and decides to build her own monster car. “Spirit of the Woods” (11/3/97) – A young boy saves T.J. from Lord Litter and attracts the attention of Divatox who wants his powers. “The Song of Confusion” (11/7/97) – Cassie and her friend audition their band at the juice bar, and Divatox sends some monsters to use her music to brainwash people. “The Accident” (11/10/97) – Carlos is wracked with self-doubt after accidentally injuring a teammate on his soccer team. “Cassie’s Best Friend” (11/11/97) – Cassie’s dog is turned into a person and he enjoys things as a human while helping Cassie look for himself. “The Curve Ball” (11/12/97) – T.J. has trouble hitting a curve ball, and Divatox exploits this weakness with her latest monster. “Carlos and the Count” (11/13/97) – Divatox transforms a lunar bat into Count Nocturne and sends him to put the bite on Carlos, turning him into a vampire. “Little Strong Man” (11/14/97) – When an ant bite gives Justin super strength but prevents him from morphing, he has to choose between keeping it or staying a Ranger. “The Rival Rangers” (11/17/97) – Ashley gets a date with a boy Cassie likes, and the boy ends up turning the girls against each other. “Parts and Parcel” (11/18/97) – Bulk and Skull are being blamed for thefts of electronics and T.J. offers to help prove their innocence. “Chase Into Space, Part I” (11/21/97) – Dimitria and Blue Senturion head to Eltar to help Zordon; Goldgoyle is summoned and destroys the megazords; Divatox attacks the Power Chamber. 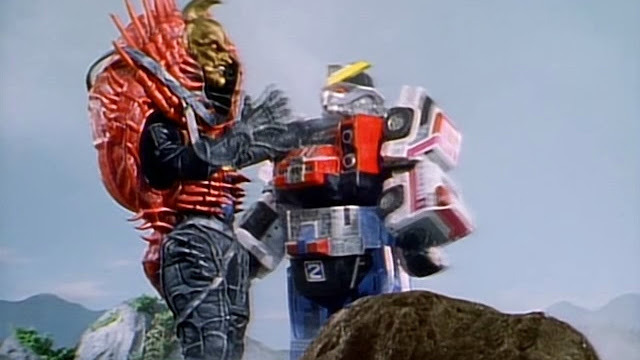 “Chase Into Space, Part II” (11/24/97) – Divatox renders the Rangers powerless before being summoned by Dark Specter after he manages to capture Zordon. 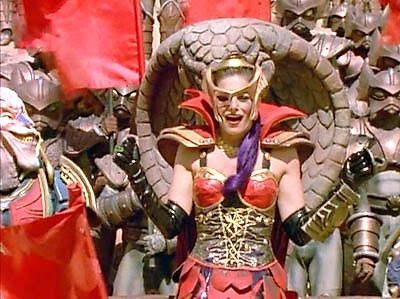 “Turbo: A Power Rangers Movie” (3/28/97) – The Rangers have to save Lerigot from the plans of Divatox, but discover that their Zeo powers aren’t enough to defeat her and her minions.